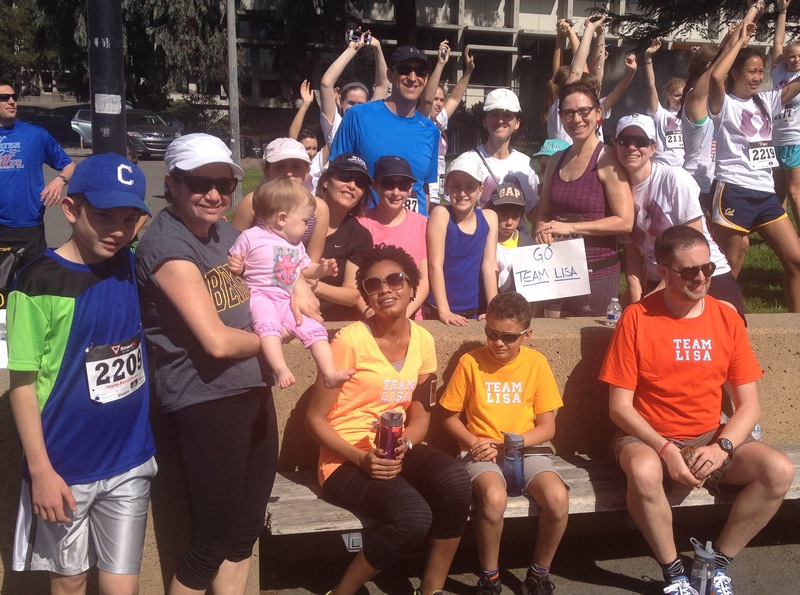 Last weekend, Team Lisa made a strong showing at the 2014 Jog for Jill in Berkeley. 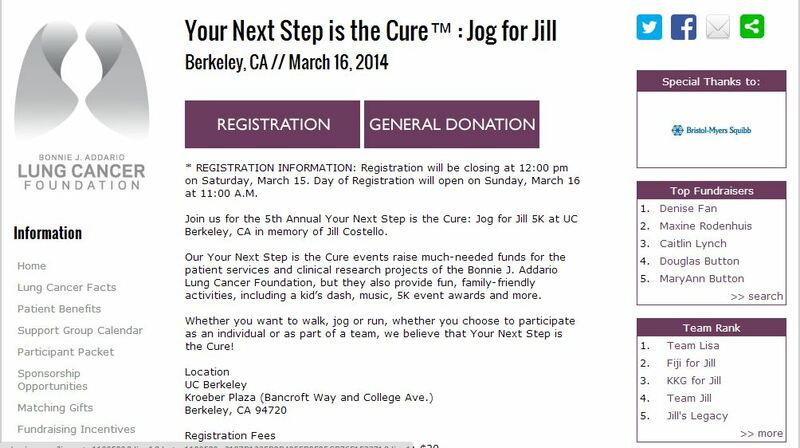 The event is a fundraiser for the Bonnie J. Addario Lung Cancer Foundation held in honor of Jill Costello, a UC Berkeley student and member of the crew team who died of lung cancer at age 22. Team Lisa was coordinated by Sara Boyd Payne. It means a lot to us to support the Addario Foundation. 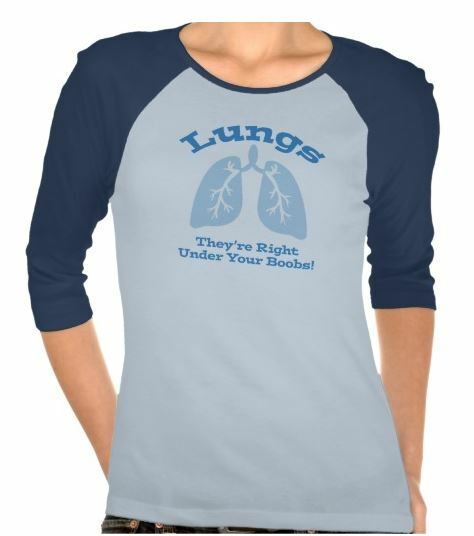 They have already provided us with a lot of helpful information and support, and they understand the unique issues of lung cancer victims better than anyone else. Team Lisa also made its presence felt in the race results. Team leader Sara took first place in her age division, pulling down a $25 Target gift card as a prize. My sister Sandy and brother-in-law Jay both took 3rd place in their age divisions, each scoring a $10 Target gift card. Family friend Aviv took 5th place in his age division. I asked my sister about the secret to her success. She said the key is to run an event on a college campus, which will draw comparatively few old folks (I may be putting some words in her mouth) and thereby lessen the competition. The run itself was a lot of fun. It was mostly college kids from Berkeley. And while the route through campus was shorter than the advertised 5K (we’re guessing it was about 2.5 miles), it was very hilly, but beautiful! 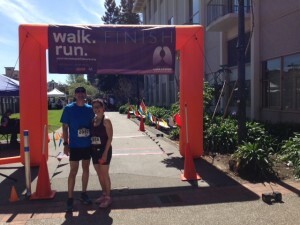 I was the first member of our team to cross the finish line, but the next member of Team Lisa was only a couple minutes later. I stayed at the finish line for a while, cheering on the team members as they came in. The atmosphere was very laid back, but you could tell people were committed to the foundation and to raising money for the cause. All in all, a fun event and I’m glad we did it! 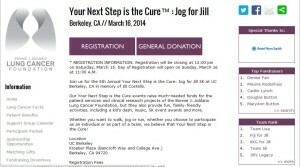 Many thanks to the team participants and the other supporters of Team Lisa. 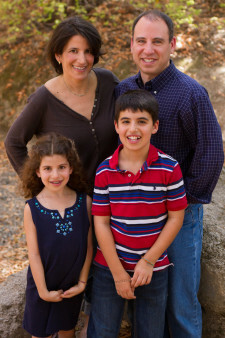 We continue to derive a lot of strength from your support. For more photos from the event, see the official race photographer’s website, including #s 65 (Sara with Team Lisa sign), 80 (ditto), 158 (Jay and Aviv finishing strong), 193 (the Uzan/Crystal family), 197 (Sandy and Sara clapping or praying), 198 (Sandy, Sara and others inspecting a really cool earthworm), 199 (Sandy and Jay celebrating what $20 can buy at Target) and 204 (a fist pump for the fight against lung cancer).